At The Parkway Dentist in Fort Worth, we make every effort to keep a state-of-the-art dental practice in order to provide our patients with the best possible care. That includes laser dentistry. The powerful, precise, highly-concentrated beam of light formally known as Light Amplification by Stimulated Emission of Radiation (LASER) is so common now that the acronym has been relegated to lower case. Lasers are used in everything from weapons to barcode scanners. They have increased efficiency and advanced technology in numerous industries such as communications, manufacturing, and virtually every branch of science. 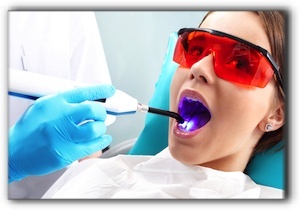 Lasers are used in many areas of dental care. They allow us to be extremely precise when working on both tooth and gum tissue. Laser dentistry is just one of the ways we provide dental health care. We offer a wide range of services, including general and family dentistry. Call The Parkway Dentist in Fort Worth today to schedule your next cleaning and checkup.